Orbital ATK aims to launch on Nov. 10 its Cygnus spacecraft aboard the Antares rocket to deliver crew supplies and scientific equipment to the International Space Station. NASA said Saturday the spacecraft will lift off from a launch pad at the agency’s Wallops Flight Facility in Virginia to mark Orbital ATK’s eighth cargo delivery mission to the orbiting laboratory as part of the company’s $1.9 billion Commercial Resupply Services contract with the agency. Orbital ATK said final preparations for the OA-8 mission will start in early October to meet the target launch date. 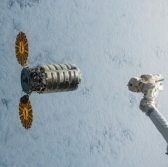 The company carried out its 7th cargo resupply mission to the ISS in April through the launch of a Cygnus spacecraft, nicknamed S.S. John Glenn, aboard a United Launch Alliance-built Atlas V rocket that took off from Cape Canaveral in Florida.